Making my first house a home. It has been three weeks since I moved into my house and I have gotten a decent amount of stuff done. Not as much as I thought I would, but more than a little. I have painted, organized, unpacked and started to settle. My entire kitchen is unpacked and functional things are starting to fall into place. After my last post, I realized that everything can’t get done overnight, especially when two out of the last three weeks I have been away on trips and the next few weeks promise the same. Slow and steady wins the race, right? It’s not like I am going anywhere. I plan to settle and dig my heels in deep. In the tumult of all of this though, I decided that small decorative projects do not have to wait until the big ones are done. So I made a plant shelf. Yay plants! I love having plants around the house. There is a nice wide window sill in my kitchen that has several on it, but with the curtains. I cannot see them. The three-pane kitchen window also did not have blinds on them and I did not want to put any up. 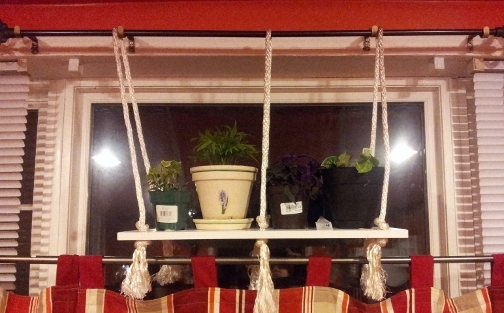 So, to kill two birds with one stone, I made a plant shelf to put over the cafe curtains. I was inspired by this post, but it did not have clear instructions. So I winged it, like I so often do, and it came out great. Since it was a smaller shelf, I decided to drill three sets of holes- two sets on the end and one in the middle to distribute the weight well. 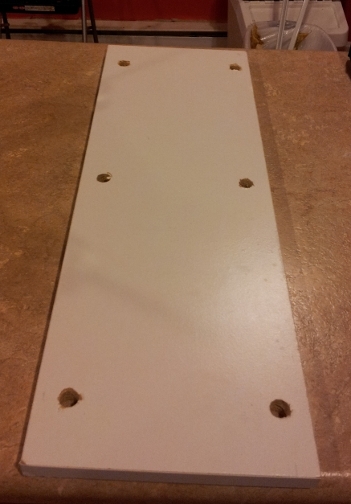 I Made the holes 2″ from the short sides and 1″ in from the long sides. Since the rope was 7/16″, I used my brand new boring bits to make a 9/16″ hole to thread the rope through. I love the smell of bored wood in the morning! This was tricky and I ended up cutting the rope too short at first and had to cute more. I got 100 ft., so I have plenty still left over. 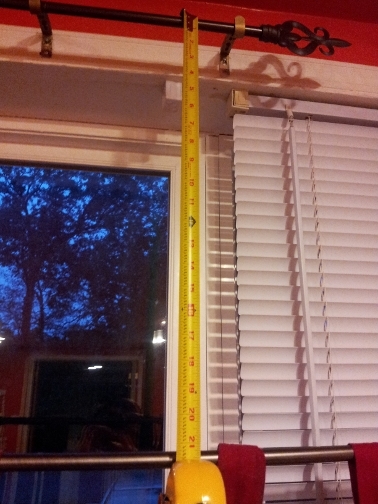 I measured the length from the curtain rod to where I wanted the shelf to end, which was 21″ here. The adage goes “measure twice, cut once”. I really should follow that. 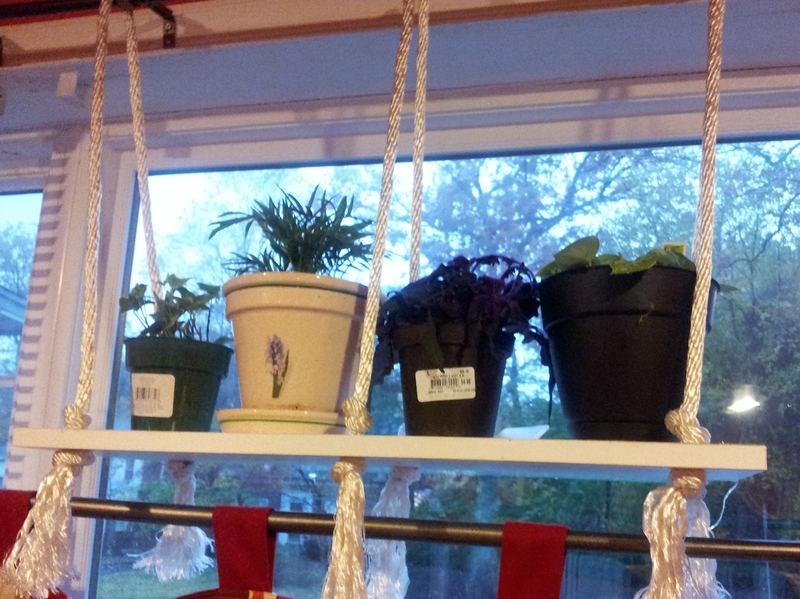 After I knew how low I wanted the shelf to hang, I doubled that measure, then added extra rope to make the knots with. At first, I only gave an extra 10″ on each side, but this was not enough and in the end I used 70″ ropes for each set of holes. Since I added 14″ of extra rope for each set of knots, I made sure to make my first knot at 14″ from the end of the rope. I did this by measuring up 14″ and putting my thumb at that point, then tying a basic knot and positioning it so it ended at my finger. Very scientific, right? After I tied the top knot, I threaded the rope through the first hole I made. It doesn’t matter where you start. I made another knot underneath the shelf, as tight as I could to the wood. There will be extra rope, which I unraveled and left dangling. DO NOT cut the rope right below the knot, as it will have a higher tenancy to unravel. 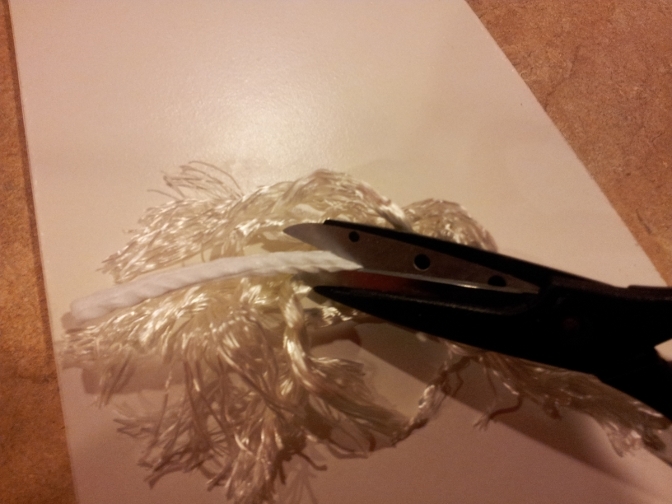 I also cut out the cotton cord under the knot so it looked nicer when the braid was unraveled. Sometimes you just need to cut the cord and move on. I could not get a good shot from outside, but it looks really nice and adds privacy. I got two more shelves to make a double shelf in another room. More about that process when I embark on it!